The meeting was called to order by the President, Ann Swanson. 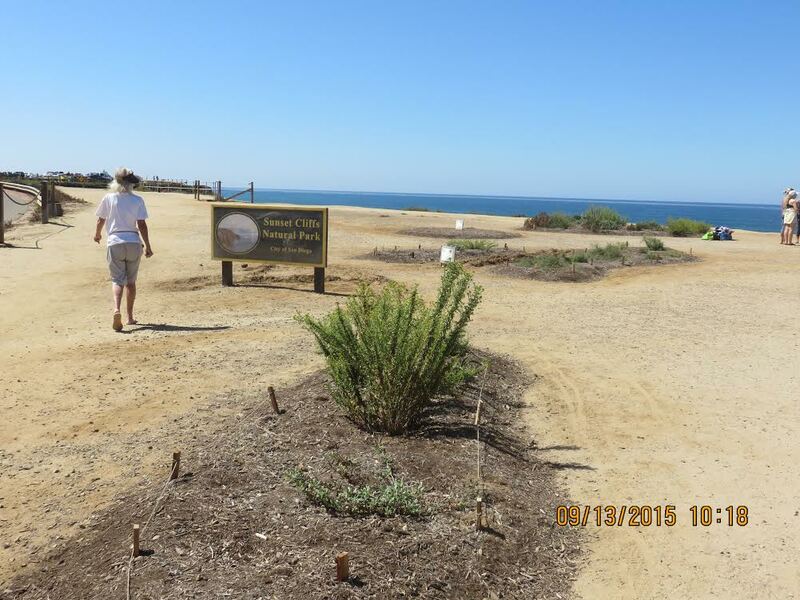 Two important items were on the Agenda: Sunset Cliffs Native Plant Demonstration Garden and Water Quality Management. There was considerable discussion and some dissension over the Demonstration Garden. This garden is being implemented by the California Native Plant Society and was granted a right-of-entry permit to the northern portion of the linear park for the purpose of planting native plants. There is some concern that this project is not turning out the way it was originally envisioned, which was reflected by the vote that followed the discussion. Some background: The report of the Ad Hoc North Entry Committee presented at the August 3, 2015 open meeting of the SCNPC called for mutual sharing of concerns and understanding between the SCNPC, city staff and the California Native Plant Society (CNPS) garden stewards regarding the North Entry Project. This is vital to protect the park. It is particularly important at this time due to the highly predicted arrival of El Niño storms. I recommend and move that the SCNPC establish a collaborative working relationship with the CNPS stewards regarding the north entry re-vegetation project concerning issues described in the SCNPC August 2015 minutes. This shall involve mutual invitations by the SCNPC Ad Hoc North Entry Project Committee and the CNPS garden stewards to attend and participate in each others meetings. Ellen Quick, chair of the Trails Committee, reported promising news from visitors; when Coastal Conservancy personnel toured the park they voiced support for a future $800,000 grant to support the Trails Project, for which the Coastal Conservancy had funded the design. The City of San Diego is in the process of preparing the grant application. Conrad Wear of Zapf’s council office was there to let us know that the promised park ranger for Sunset Cliffs and Ocean Beach has been selected and will be in place in mid-October. He or she is currently in the background-check phase, as this position includes responsibilities of a sworn law-enforcement officer (no convicted felons need apply). Also a geotechnical consultant has been hired to recommend solutions to the Orchard Street Cave problem. It was reported that both police and lifeguard presence had resulted in fewer cliff-leaping feats; over 100 warnings were written in one day at the arch, but no arrests, and all was handled in a friendly and helpful manner to promote safety. A letter to Mayor Faulconer in support of the police and lifeguard effort was voted to express the council’s appreciation. This sounds like a dedicated ranger for just Sunset Cliffs and Ocean Beach but this one ranger will have a lot more area than just this. At best, the Ranger will be part time at Sunset Cliffs and OB. Additionally, Zapf is taking credit for recommending the ranger for the budget but six councilpersons recommended the new ranger position for the budget. Newer Article: Did Native Kumeyaays Live at Ocean Beach Before the Spanish Arrived?